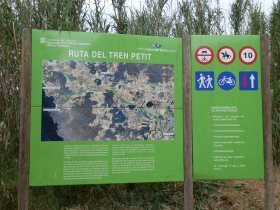 The Ruta del Tren Petit is a set of tracks that follow a disused railway line that has been converted into a footpath and cycle track (a Via Verde) that connects Palafrugell with Palamos (and also links to Mont-ras and Vall-llobrega). The Ruta del Tren Petit is almost like a spine with routes off it connecting to all the main beaches between Palamos and Llafranc. On the way it passes through fields and plains that sit in the small plain the hills of the Gavarres to the west, and the coastal hills to the East. As this is our neighbourhood, this is a path we walk a lot and we make much use of the connections from the Ruta del Tren Petit across to the beaches and coves of what is one of the most beautiful areas of the Costa Brava. 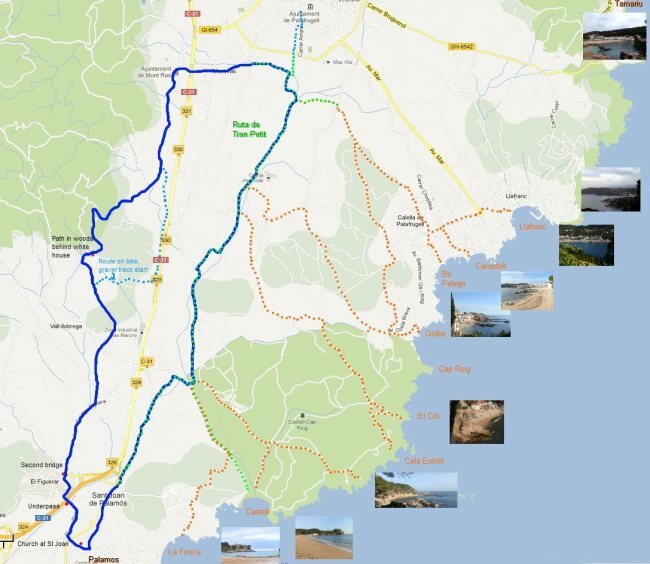 So in addition to describing a walk along the Ruta del Tren Petit, we have included a map of all the links from the Ruta across to all the main beaches and coast line from La Fosca to Llafranc (and Tamariu included at the top for good measure). Click on the map below to see this fullsize. We also mentioned the Ruta del Tren Petit in our walk from Mont-ras to Calella de Palafrugell and Llafranc. For visitors the beauty of the route is that it gives great walking and cycling and links to the best places through the countryside without problems of cars or traffic making it safe to take children or for casual quiet strolls. For holiday makers it also connects various campsites, hidden restaurants and farm masias and if you are without a car, hiring bikes makes this a very easy way to visit the neighbouring areas. To include the Ruta on the blog we're walking from Mont-ras/Palafrugell down to Palamos and then returning via Vall-llobrega. In practice this would be best done as a bike route as it's pretty flat and easy cycling on a hard gravel surface. We're walking - a round trip of about 3 hours. On a bike, the full length Palafrugell to Palamos journey should take about 20-30 minutes. We're starting in Mont-ras down through the village past the line of shops in the direction of Palafrugell. We walk through the small block of houses and reach the fields. The starting path is just along to the left, clearly marked with a big sign and map. If you join from Palafrugell walk down to the Esclat on the ringroad and cross the road by the garden centre to get to the path. 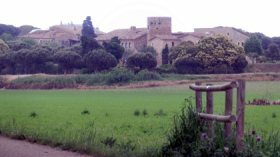 The starting route passes along the edge of a large field towards a large farmhouse (Mas Roig) with a tower on the right hand corner. At the corner of the field a path comes in from the left - this is the route in from Palafrugell across a small stream. 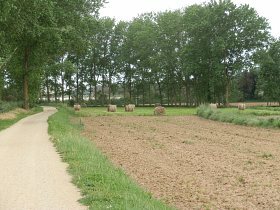 The path then continues around the top of the field and along through the plain following a small stream (the Aube river). In fact the path follows this stream all the way down to Platja de Castell. There's a junction here, taking the left path takes you past Mas Roig and then out to the centre of Calella (see Mont-ras to Calella and Llafranc). Walking is easy and enjoyable. The plain is punctuated by small tree covered hills, small copses and views out to the hills on either side. These are working fields and there is continual rotation of crops and foliage through the seasons. In the first spring rains the fields can fill with water and resound to the sound of hundreds of croaking frogs. 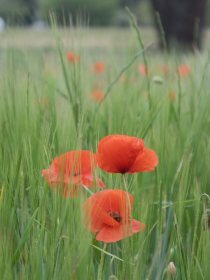 Now, in May, there is wheat and meadow grasses interspersed by poppies and wild-flowers. A shepherd is tending a mixed flock of sheep and goats close to one of the farms and across the fields the tower of Torre Simona can be seen, one of the watch towers from when these coasts and villages were attacked by Barbarossa's Barbary Pirates in the 16th Century. We come to the first crossroads where two paths cross. To the right the path leads back to the small urbanisation of Torre Simona, to the left are two small stone bridges each over a different stream. The upper stream about a metre higher than the lower. There's water in the stream and a mass of verdent vegetation. In summer they will be dry, but in winter with the rains they become deep swollen rivers. 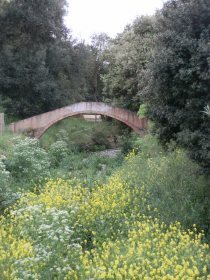 Across the bridges, this path links to a road that curls around the enormous house and estate of Mas Oliu and to paths that link to Ermedas and onwards to Calella de Palafrugell and Golfet. We carry on and the next junction with a road. The roads in this area link the various masia farmhouses that dot the landscape, built in a traditional Catalan style out of stone with a long V roof. Many have been restored with large mature gardens and swimming pools. Others have been turned into restaurants or remain as farms. This particular road runs towards El Crit, but turns back to a gravel track once it passes the last of the masies. The next junction also takes this route to the left, but the road is bigger and passes through a ford, empty now, but full of water a few weeks ago. At this point, the Ruta del Petit Tren takes a sharp right, then down the track, a sharp left so it runs next to the small road that also takes this route. We're walking past a large farmhouse hidden behind hedges and fences. 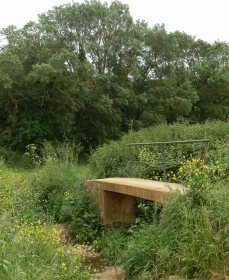 Ahead a small arched-footbridge stretches across the stream, but at this point the stream is full of yellow flowers of rapeseed. Past the Masia, we pass through a small grove of trees and then a very well maintained garden/allotments (horta) before walking past a pretty house with blue shutters looking over a field of olive trees. On the other side of the path, another shepherd is out with a mixed flock and a billy goat bossing the sheep about. We pass the waterworks and on to what at first sight seems to be the end of the path. A road cuts across the Ruta. To the left the road runs down to Platja de Castell past Camping Benelux and Hotel Malcontent. Straight on, there's a continuation - this heads down towards Castell too, but also links to La Fosca. We follow the path across the road to the right about 50m before it crosses the road again and we head on in the direction of Palamos. We're not too far from the C31 dual carriageway and can hear the cars, but a line of trees mean we still feel we're in the country. To the left is a large Masia with a tower. We keep going on past and reach the end of the path just behind a petrol station. To make this a round trip the aim is to come back via Vall-llobrega, but first we go straight on, along the small road behind the houses on the main road. We're heading for Sant Joan de Palamos and can see the church ahead of us. We reach the old heart of the village (now part of Palamos itself) - a set of narrow streets. 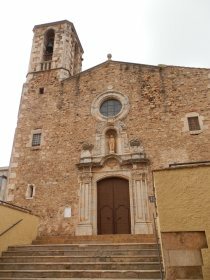 Sant Joan de Palamos is the original entry point into Palamos and the old entry road ran through the village. From the narrowness of Carrer Major this main route would have been very difficult with any type of large vehicle. We walk past the church and then out across the main road to Carrer Riera and out through an industrial estate, before taking an underpass beneath the new dual carriageway and into the slightly haphazard estate at Vila-Roma. Palamos has always been something of a working town and its houses and streets on the outskirts lack much in the way of charm. We continue around Vila Roma - the white statue of a ladies face sits on the roundabout. This used to be closer to the main road until the dual carriageway was developed. We take a small bridge which looks like a footbridge but still seems to be used for cars out in the direction of La Figuerar. Until we leave Vall-llobrega the route follows the road, but it's very quiet, only used by the occasional vien or vecino (neighbour). We walk behind through an old hamlet and around the base of one of the isolated hills that sit in amoung the fields. At the second left we follow the road past a line of modern villas towards Vall-llobrega up to a cross roads. At the cross roads we continue straight on. Our route is towards Can Sidro. Vall-llobrega consists of a number of luxury estates sheltered in a curve in the hills of the Gavarres. Mostly it's new villas and buildings, but along the road we're walking it consists of large older houses in several acres of land. The road climbs and we get a sea view across Cap de Palafrugell and out towards the high rises and port of Palamos. We pass Can Sidro - a restaurant with views across the village of Vall-llobrega and into the hills. If you're taking this route as a bike path you need to take the right hand road just at the gates of the next house (not the private road), down the hill. This gravel track is the road that links to the road with Mont-ras below - being gravel it confused us when we first tried to find it - we were expecting a tarmac road. As we're walking though we continue, past a pretty peach-coloured house with a vineyard in front of it to the next junction. We turn right up the hill at the back of a luxurious modern house with a big swimming pool in its grounds. The path continues along by the fence and then almost round the back of a white farmhouse and into the woods. This path is quite secluded through the trees and it's peaceful. We follow it round the valleyhead and out by a collection of small-holidings to the sound of chickens and geese. We continue straight on and eventually emerge across a small stream close to the estate of Molines in Mont-ras. Still straight-on along the field track full of flowers in reds, yellows, purples and whites. The road we reach is the main old road through Mont-ras - as is typical here it's very narrow and passes old houses and masies with little traffic. We continue and eventually return to the Ajuntament of Mont-ras and it's small village square outside the library. 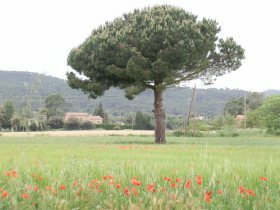 We walked the ruta a couple of weeks ago from Palafrugell to Palamos returning by bus from the bus station in Palamos. We found it difficult to find the start of the ruta in Palafrugell, needs better signing from say the Placa Nova, and also not easy to know where to go when the ruta ends at Palamos if you want to find the bus station. Again signage would be useful. Very enjoyable walk and we'd do it again but not in June as it was far too hot for walking. I'd agree that the start points could be better signposted. From Placa Nova, I'd take the route past Gretel's Frankfurters and bear right past the bookshop down the small street to connect to Carrer Ample. Down to cross the ringroad by Esclat. In Palamos from St Joan de Palamos follow the road as it runs to the centre of town. The bus stop is just at the back of the two tall (and ugly) towerblocks in Palamos. This route looks great. Thanks for map and directions. For a couple in their mid 60's with reasonable fitness how long should it take from Palafrugell to P alamos and how many kilometres? It's about 8-9km so a couple of hours walking relatively briskly. Rather than quite following the whole route you might want to track down to Platja de Castell and then along the coast to La Fosca before coming into Palamos, which might add a little.